UPDATE! COLLECTION #4 NOW AVAILABLE FOR PRE-ORDER! This is it! 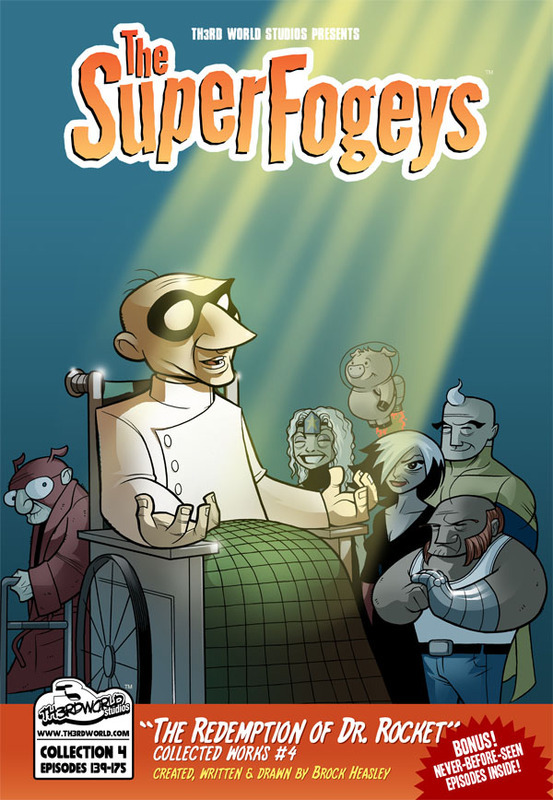 The cover to the fourth collection of the SuperFogeys. Dare I say it’s our best one yet? Didn’t start out that way though. Th3rd World Publisher Michael DeVito deserves all the credit in the world for the stellar job he did on the coloring for this thing. It didn’t look like much as originally drawn and he really took it somewhere special. You can order your copy of Collection #4 (Collecting Chapter 5, the bonus story “Audition,” and “Erin’s Comic!”) for $5.50 and get all the details here in the store! Also, for the first time ever, we’re offering up an Artist Edition. 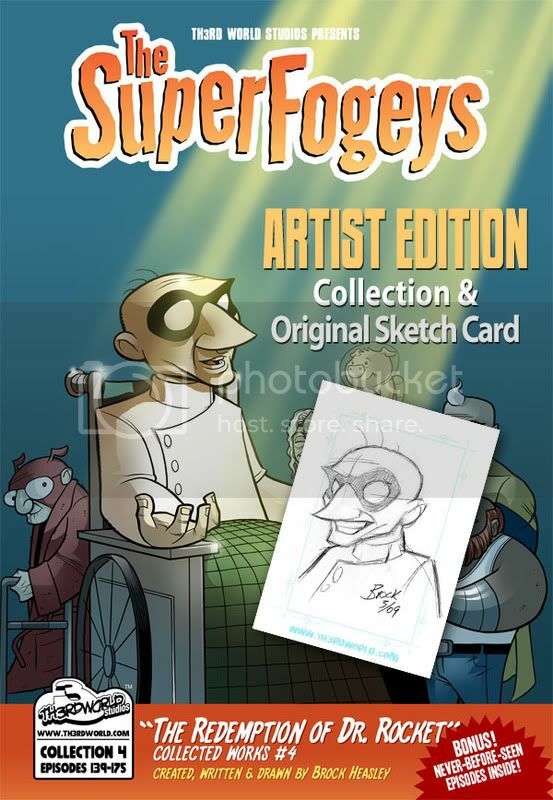 What that means is that if you purchase this you’ll get not only Collection #4, but also a sketch card with an original pencil sketch drawn and signed by yours truly. $10 gets you both, but you can also order the sketch card by itself for $6. And yes, there is a way to request your favorite character! Pre-Order your Artist Edition right here! I had the most fantastic weekend. My wife Erin turned the big 28 yesterday and we celebrated in style by staying in Huntington Beach, CA and going to Disney’s California Adventure on Saturday. It’s not Disneyland, but it’s pretty close. Really a fun place. Also got a little writing done on the book about my father I’m working on, so to those of you that asked that’s going pretty well. I’m really catching a groove on it now and I can only hope it’s as good as I feel that it is. See you tomorrow for a new SuperFogeys Origins. Check back on Wednesday for a new preview of the exclusive-to-print contents of Collection #4. The idea is to try to represent Dr. Rocket’s redemption in one illustration and a lot of the eventual heavy-lifting on this one will be done at the color stage when a shaft of light will shine down on Dr. Rocket and everyone else will go back into the shadows. Hopefully, it will actually look good, which I don’t think it quite does at the moment. Welcome to my process. Updates as they happen. Also, real quick, I’d like to take this opportunity to officially announce that one Mr. Lucas Turnbloom is doing the art for the bonus story in this next book. The story is entitled “The Audition” and features Captain Spectacular hosting an “American Idol”-like competition for a new partner in the late Sixties. What happens when the Space Pig AND Dr. Rocket show up? And…wait, is that the Third Man!? I hope you’ll all forgive me for this admittedly weak update. Ending one chapter and beginning another is tough for me in that it requires such a gear shift. Plus, with the nearly 100 comments left about the last strip, you all have been taking up quite a bit of my time lately! I love it, but I’m a little wiped out. All in all, I’d have to say that Chapter 5 turned out rather well. Oh sure, there were the occasional art hiccups here and there, and some strips got overly wordy (no surprise), but I think it’s the strongest group of strips I’ve done yet. Looking at what the chapter was about and taking into account the bit of shock that was the ending, Chapter 5 was a bit of a line in the sand. Some of you didn’t feel like crossing that line with me, and I understand that. (See the somewhat heated debate in, again, the comments here.) I was hesistant at first as well. SF was light and fluffy for a while there, but there’s always been this undercurrent that I’m starting to bring forward. Now things have changed a bit. Grown a bit darker. It’s an important shift whose full impact won’t be felt for a while. But when you do feel it…hoo boy. I think I have a pretty terrific story to tell you guys. If you like what you’ve seen so far…well, you ain’t seen nothin’ yet. Webcomic Idol, Week One is in full swing and despite some good support from you all, SuperFogeys needs more! SF is garnering enough votes to be in the Top 5 vote-getters, and if it stays there then it will be booted from the competition in a few days. Here’s the confusing part: In order to help SF, you have to vote for another comic entirely. You’re voting for which comic you want OUT of the competition, not in. Voting could not be simpler. Follow this link, click on the comic you want out of there. That’s it. Not registration, no leaving your name, nothing. It could probably take less than two seconds if your connection is fast enough. Yes, you read that right. Michael Johnston, West Point Cadet and friend of the SuperFogeys (he started the SF group on Facebook), wrote up a paper analyzing the rhetorical images in the SuperFogeys, specifically SF 167. He has graciously agreed to allow me to share it with all of you. Check it out in my newest blog post. Here’s something I never do: I’m going to tell you a bit about what you can look forward to in Chapter 6. Obviously, I’m not going to spoil anything big, but if you’re sensitive and want to know NOTHING about what’s coming, best to look away. That’s right, it’s aSPOILER ALERT. Chapter 6 will open up on Dr. Rocket’s funeral. In fact, about 90% of Chapter 6 will take place outside of Valhalla. Big change of pace. We’ll see the entire funeral and hear some nice and not-so-nice words about the good Doctor. We’ll also get to find out the origins of Captain Spectacular and Dr. Rocket, something I’ve been wanting to do for a long time. If you love flashbacks, you’ll love Chapter 6. Expect a little mystery raised by the last panel of Chapter 5 to be solved. Any Healer fans out there? He makes his long-awaited return. A character previously only glimpsed in the background will finally come forward and say a few words. And, because you demanded it, someone WILL call Captain Spectacular out on his failure to act at the end of Chapter 5, but it’s probably the last person you’d expect. How’s that for a tease? It all starts next week.